Another way to examine attitudes across media outlets is to look at the relationship between the ideological profile of the audience of each outlet and where people think it falls on the left-right spectrum (o-to-6 scale). The majority of the 64 outlets included in this study (eight outlets in each of the eight Western European countries) have audiences that tend to cluster around the ideological center. However, differences emerge when looking at where people who have heard of the outlets place them on the same left-right spectrum. In most cases, people’s perception of the left-right ideological orientation of a news outlet is more partisan than the profile of the outlet’s actual audience. In part, this difference is due to the fact that those who use an outlet are more likely to see that outlet as being closer to their own left-right ideological leanings. In addition to examining the audience’s ideological composition for eight outlets in each country, the study also asked people who have heard of the outlets where they think each falls on the left-right ideological scale, where 0 represents the far left and 6 represents the far right. The results show that where people place an outlet is tied very closely to their own ideology, as well as their use of that outlet for news. For many outlets, news users on either the left or the right tend to think the outlet is closer to their own left-right ideological leaning. This comes through most strongly in the UK, Italy, Denmark, France and the Netherlands. The pattern is less prominent in Germany, Sweden and Spain. For example, in the UK, 98% of British adults have heard of The Guardian. Among those who have heard of the newspaper, 33% place the outlet on the left side of the ideological scale (0-2) and 24% place it on the right side (4-6). 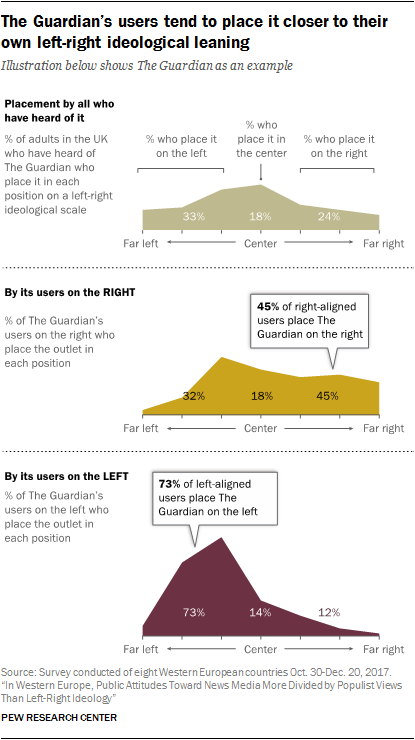 Differences emerge, however, when comparing The Guardian’s left- and right-aligned users. Among users on the right, more than four-in-ten (45%) say the newspaper’s political leaning is to the right of the ideological scale, compared with just 12% of left-aligned users. Conversely, a large majority of left-aligned users (73%) say The Guardian is on the left, compared with just 32% of right-aligned users. It is also worth noting that for many outlets, a large portion of adults who have heard of an outlet decline to place it on the scale. 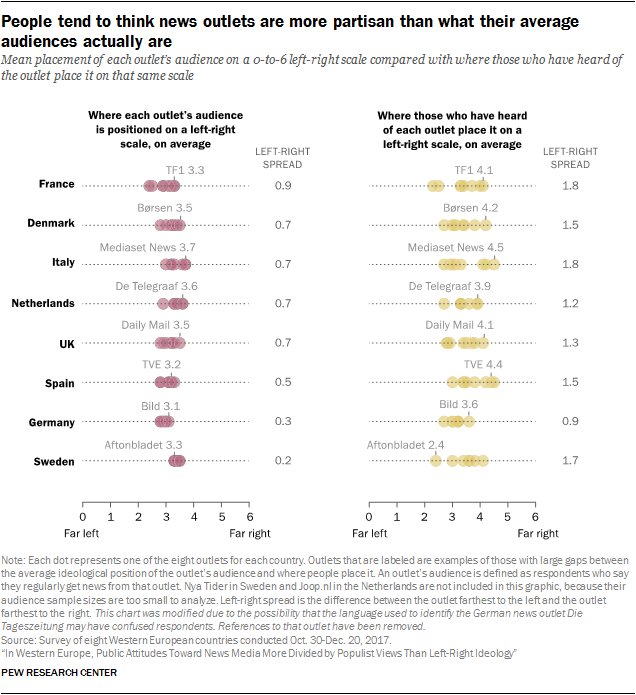 Within each country, on average, between 21% and 29% of adults who have heard of a news outlet choose not to place it at all. This tends to occur more among non-users than users of an outlet and also more often for digital-only media outlets. For example, 49% of Dutch adults who have heard of the digital-native news website Joop.nl do not place it, and 51% of Swedes do not place the Swedish digital-native news site Flashback. Unlike users, non-users tend to perceive outlets as being farther away from their own left-right ideological leaning. For example, while 32% of French non-users of BFM on the right think BFM is also on the right, 50% of left-aligned non-users think the outlet is on the right. For the majority of outlets studied, the self-reported audiences tend to cluster around the ideological center. But in general, people who have heard of each outlet tend to place it either farther to the left or farther to the right than the self-reported audience results. For example, French TV channel TF1’s self-reported users in the survey are concentrated around the center of the left-right continuum (at a 3.3 on the 0-to-6 scale.) Yet, when people who have heard of TF1 are asked to place it on the same left-right scale, they place TF1 significantly farther to the right (at 4.1). In Sweden, the newspaper Aftonbladet’s audience is also near the center of the left-right spectrum (3.3). However, people who’ve heard of it place the outlet farther to the left (2.4).